Entry into these elite military orders were no easy feat, an Aztec warrior, noble or otherwise would still have to prove themselves worthy before they would be accepted to the ranks of the cuauhtlocelotl. Due to the militaristic nature of the Aztec society of course the feats were war focused. Historians have stated that to become a Jaguar or Eagle warrior, one would have to capture twelve or more sacrifices in two consecutive battles. This is of course a large task for any warrior and thus ensured that only the best warriors would be accepted to this esteemed military order. The Aztec eagle warrior, or cuacuauhtin in classical Nahuatl, were as we know a revered order or class of warrior in the Aztec military. Adorned in feathers, with clothing and shrouds for the head, what mimic the visage of their namesake, the Eagle warriors were surely a splendour to behold. The Jaguar warrior, known as an ocēlōtl in classical Nahuatl, were the sister order to the Eagle warriors and some of he most elite warriors in the Aztec army. 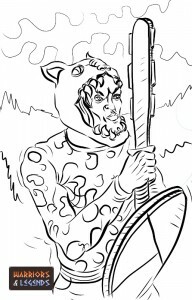 Their style and uniform was based on the Jaguar itself, with the warrior being dressed in animals skins, and a helmet or shroud that resembled the head of a jaguar. An Aztec jaguar warrior known as an ocelotl in classical Nahuatl. Due to their experience on the battlefield and their bravery, its likely the Eagle and Jaguar warriors were placed at the fore of the pack. The mere sight of these warriors by the enemy would have added a psychological edge to the Aztecs. It is also reported that their experience and skills made the Eagle and Jaguar warriors great additional leaders for less experienced warriors. The mere presence of the revered Eagle and Jaguar warriors would give new warriors confidence in the battlefield. Joining the order of the cuauhtlocelotl the Eagle Jaguar warriors, was open to both Aztec commoners and nobles, giving equal opportunity to all who were worthy. Joining however as we mentioned earlier required feats of bravery and skill in battle, and being accepted to this particular order was not easy. It’s thought by many historians that this like many or the high ranking Aztec orders, was mostly populated by the noble Aztecs. But what we do know is that commoners did join the cuauhtlocelotl, and reaped similar benefits as the noble folk. To join the ranks of the mighty Eagle and Jaguar warriors was a difficult feat, but for those that did, the benefits were plentiful. Joining the cuauhtlocelotl ranks, was not only a social step up, but also offered tangible benefits. The cuauhtlocelotl could wear fancy clothing and jewellery that were not available to everyone, like wearing sandals in royal areas, and to even wear military clothing in normal society. They were also allowed to dine in the Aztec royal palace, and feast on human flesh should they desire. Additional benefits included the option of concubines, additional relationship outside of their normal marriage and the reward of being able to drink in public should one choose. The eagle and jaguar warriors were part of the same order, despite the two styles of dress and name. In Aztec society they would be referred to as one order, and that order was one of the highest ranking warrior classes. They were the brave warriors who proved their battle skills by capturing sacrifices in a number other warriors could only dream off. Because of this level of battle skills they garnered status and respect were bestowed upon them, the Eagle and Jaguar warriors were part of the elite warriors of the Aztec military.